The Blackstone Pass Trap is a Tactical weapon. Between these two pillars lies an anomaly of time and space, a void which emits a siren song that only mice of the Mystic Team can hear. 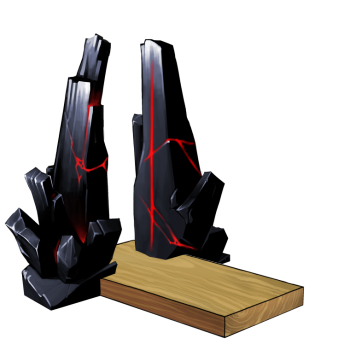 The Mystic King uses pieces of this stone to gather his minions to him in times of crisis, but these monoliths emit enough hypnotic vibrations to draw even the King himself between the pillars. Once the mice pass through this gate, they step into another plane of being, never to return. The Blackstone Pass Trap is not sold by any Trapsmith. It can only be crafted given the proper ingredients. The Blackstone Pass Trap has an inherent increased effectiveness against Mystic mice and decreased effectiveness against Technic mice in Zugzwang's Tower. Obvious Ambush Trap – has similar attributes but is more effective against Technic mice than against Mystic mice. 26 August 2010: The Blackstone Pass Trap was first mentioned in the blueprints sold at the Seasonal Garden.